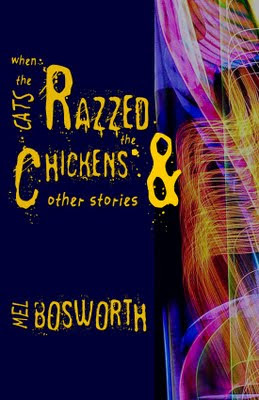 Mel Bosworth: WHEN THE CATS RAZZED THE CHICKENS & OTHER STORIES NOW AVAILABLE FOR PRE-ORDER! WHEN THE CATS RAZZED THE CHICKENS & OTHER STORIES NOW AVAILABLE FOR PRE-ORDER! Yes, that's right. A bit early, but not by much. Since all the school children are wearing their costumes today, I decided that Halloween is already here. From now until 1 December 2009, all print chapbooks will be sold for $8 (list is $9). This will include postage (to anywhere in the world) and tax (if mailed to California). Folded Word would also like to give Mel's friends/fans a treat by offering them a signature option on his chapbook for an extra $1. And no, Mel is not pocketing the buck for his golden scribble. It's for the extra envelope and stamps. ...There you have it. I love you guys. The quality of this hand-bound chapbook is ridiculously awesome. In addition to receiving either a signed or unsigned chapbook, you also get the promise of a ridiculously awesome hug should we ever meet. 11/30/2009 Notice: The personally signed option is no longer available. However, if you really want me to sign it, and I would absolutely love to, I'm sure we can work something out. Drop either me or Folded Word a note. Thanks a ton, Eric. Big hugs back at you. I want it signed and licked. WHAT!! You didn't tell me this was happening! GO TEAM BOSWORTH! I want a million. There is no money in my bank account until Wednesday. Stupid. I'm excited, mister. I owe you a loaf. Teresa: I will molest the hell out of your copy! Jason: I bow to thee, bearded brother. Thank you all so much. I weep. I really do. I'm excited (and tired, which is why you don't get a more witty comment here). Caleb: I'm excited and tired too. Can't wait for Charactered Pieces and Razzed to push each other on the swings. Thanks for the love, brother. I'm gone for a week and see what happens. The world explodes, Bosworth puts forth a new chapbook, and the economy is...er, nevermind. I can't wait for my signed copy. Which I would also request you to molest, however it's been done before, so nevermind. i will do something unique to your copy, cynthia. thank you, as always.